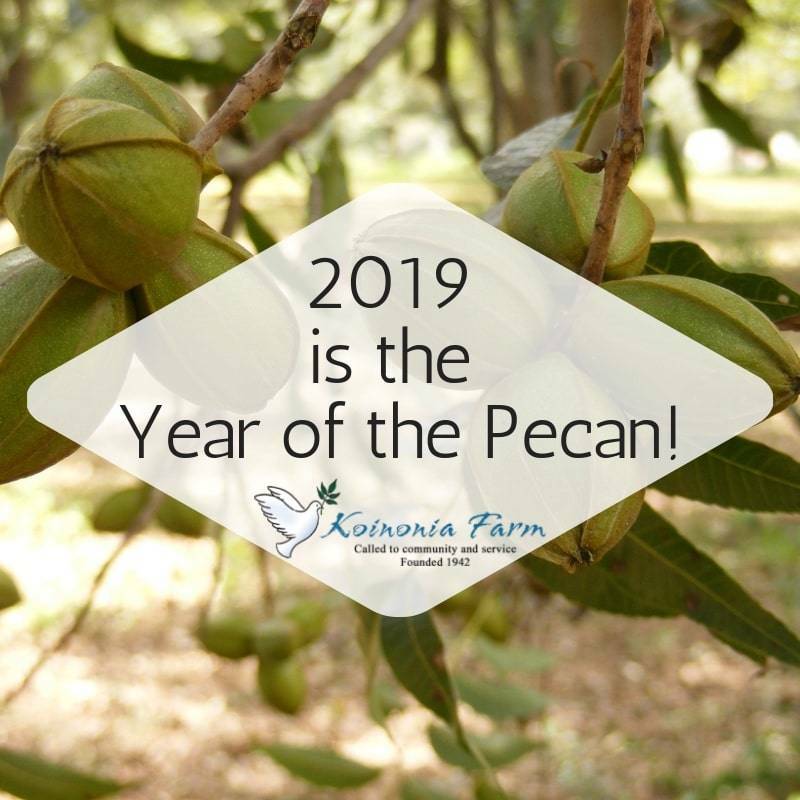 Koinonia Farm is declaring 2019 to be “The Year of the Pecan!” We are planting a new orchard, renovating our bakery, harvesting our pecans, and working hard to continue shipping pecans around the world to our faithful customers. We need your help! 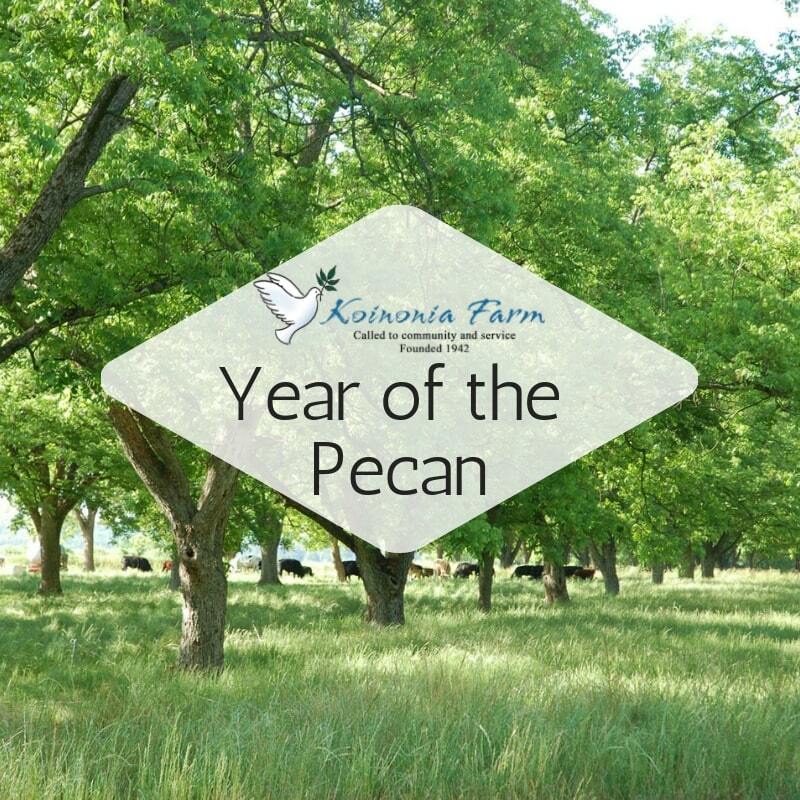 Our new pecan orchard will be 40 acres and contain an estimated 800 pecan trees. As with all our orchards, these trees will be kept happy and healthy with only biological methods. We will work from the soil up using compost tea and other amendments to keep the soil healthy, which then produces healthy pecan trees with the best quality pecans. We are also renovating our bakery, the heart of our mail order business and one of the most important places on the farm. With new windows and other improvements, the bakery will be climate controlled and able to continue producing Koinonia’s best selling pecans, chocolate, baked goods, and all your Koinonia favorites. We cannot do this without your help! 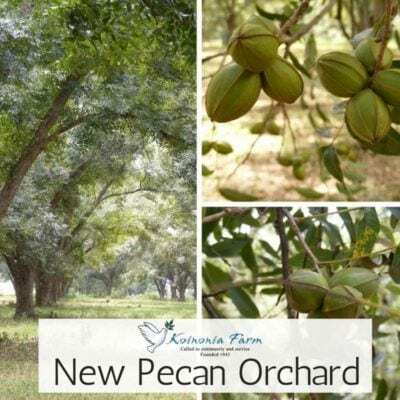 We are asking you to help us plant a new orchard by sponsoring a pecan tree for $150. You can even sponsor multiple trees if you’d like. With this money, we will be able to get the new orchard ready by preparing the soil, setting up irrigation, and purchasing supplies for the biological management of the new trees. Then we can buy the trees, plant them, and continue taking care of them with no herbicides, pesticides, or chemicals of any kind. We are also asking for donations to help with the bakery renovation. We’d happy to provide you a list of the work to be done. Perhaps you would want to underwrite a particular item on that list. A general donation is welcomed as well. We need to raise $325,000 in 2019 to cover the costs of all our ministries, expenses, and projects this year. In addition to the new orchard and bakery renovation, we must fund our usual ministries of hospitality, internship, sustainable farming, as well as Hospitality Beyond Borders, Harvest of Hope, Circle of Friends, and all the other work we have in our local community and around the world. To continue doing this good work we have been called to do, we need you to come alongside us with financial support as well as prayers, encouragements, and visits to the farm. From the earliest days of Koinonia Farm, people from around the world supported this little demonstration plot and this year is no different. With your help, we can continue our vision of love through service to others, joy through generous hospitality, and peace through reconciliation.